Oxygen, the third most abundant element in the cosmos and essential to life on Earth, changes its forms dramatically under pressure transforming to a solid with spectacular colors. Eventually it becomes metallic and a superconductor. The underlying mechanism for these remarkable phenomena has been fascinating to scientists for decades; especially the origin of the recently discovered molecular cluster (O2)4 in the dense solid, red oxygen phase. 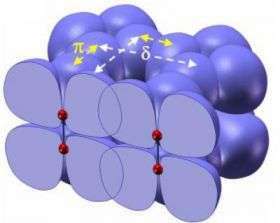 Researchers from the Carnegie Institution's Geophysical Laboratory (GL), with colleagues found that under pressure the molecules interact through their outermost electron clouds or "orbitals." Using a newly developed synchrotron technique at HPCAT, the lab's synchrotron facility at Argonne National Laboratory, the researchers found that the interaction of these half-filled orbitals increases with increasing pressure, changing the location of the orbitals, and bringing the four oxygen molecules together to form the (O2)4 clusters at a pressure about 10,000 times the atmospheric pressure (10 gigapascals). The study is published the week of August 4, in the Proceedings of the National Academy of Sciences. "The molecular interaction in oxygen revealed by this study is due to the unique fact that oxygen's outmost orbital is half-filled with two unpaired electrons," explained Yue Meng, lead author of the study at HPCAT. "As the molecules are squeezed into smaller volumes at high pressure, electrons in the orbital inevitably move about, trying to pair with electrons in the neighboring molecules." To study the dense solid phases of oxygen, the researchers developed the high-pressure inelastic X-ray scattering technique at the Advanced Photon Source, a high-brilliance synchrotron X-ray facility at Argonne. The technique uses the synchrotron X-ray beam to probe the electronic bonding change as a diamond anvil cell subjects a sample to many hundreds of thousands of atmospheres. The researchers combined their experimental results with theoretical calculations by collaborators to further reveal that there is an increasing interactions between the neighboring (O2)4 clusters in the red-colored oxygen, providing a mechanism for forming new bonding between the oxygen clusters in still higher pressure phases. "The behavior of oxygen at high pressure demonstrates one of the most profound effects of pressure on matter, which transforms the colorless air we breath into colorful dense solids," continued Meng. "The drastic change in the appearance of this familiar gas is due to the bonding changes in oxygen induced by high pressure." "This is the first demonstration of how new tools can be used to probe the subtle interactions between atoms and molecules that lead to the formation of entirely new crystal structures," said Russell J. Hemley, the GL's director. "These new structures may give rise to entirely new electronic, magnetic, and other physical properties that could lead to new technologies." The formation of molecular clusters through the anti-bonding orbital called ? * is well known in organic chemistry and the electron delocalization in cluster orbitals provides several potentials for technical applications. "It is exciting to find that oxygen forms molecular clusters under high pressure through similar mechanism and this opens a possibility for new forms of materials at high pressure with potential for technical applications," Meng concluded. Why are so many people getting a tick-borne meat allergy?
" at a pressure about 10,000 times the atmospheric pressure (10 gigapascals) "